It finished scoreless after a dramatic finale at Selhurst Park. 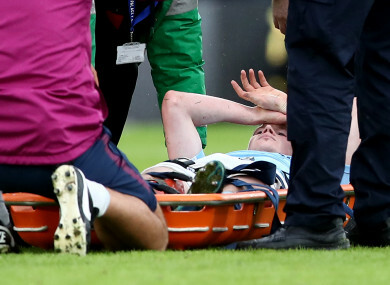 Kevin De Bruyne suffered an injury late on at Selhurst Park today. EDERSON STOPPED LUKA Milivojevic’s late penalty to save Manchester City from defeat today but a 0-0 draw at Crystal Palace brought the Premier League leaders’ record-breaking 18 match winning run to an end. Milivojevic was presented with the chance to seal a memorable victory for Roy Hodgson’s relegation-threatened side when Wilfried Zaha was brought down by Raheem Sterling in the 90th minute. But the Palace winger struck his spot-kick too close to Ederson, allowing the City keeper to preserve his side’s 21-game unbeaten start to the league campaign. However City’s failure to score in a league game for the first time since last April meant they fell short in their bid to equal Bayern Munich 19-game winning run of four years ago, the longest in Europe’s five major leagues. And City’s afternoon was further soured when Kevin De Bruyne was stretchered off with what appeared to be a serious looking injury immediately after the spot-kick following an ugly challenge by Palace substitute Jason Puncheon. Hodgson claimed before the game there was “no magic formula” to competing with City, insisting his Palace side’s hopes of getting something from the game hinged on working hard, and defending well while maintaining an attacking threat. The manager could be satisfied that during the opening 45 minutes his players stuck to the prescribed plan to the extent that by the half-time break, the frustration among Guardiola’s players was plain to see. Mangala recovered to deflect the striker’s shot away to safety but the mix-up was the first of too many for the league leaders during the first half. Both sides were forced into early changes with Palace captain in Scott Dann being stretchered off after in the 19th minute and City striker Gabriel Jesus following shortly after with what appeared to be groin problem. Manchester City's Gabriel Jesus receives treatment. Sergio Aguero, Jesus’s replacement, struck the post in the 28th minute with a deflected shot from the edge of the penalty area but that proved to be a rare moment of concern for home keeper Wayne Hennessey. An animated conversation between De Bruyne and Leroy Sane confirmed the sense that City were growing increasingly uncomfortable and Sane — who was particularly ineffective — received a yellow card on the stroke of half-time when he kicked the ball away in frustration after being caught offside. The keeper, though, proved up to the task and never more so that when he positioned himself well to block Sane’s close range volley at the far post. And they should have entered the final 14 minutes of the game needing a goal to get back on level terms after Andros Townsend missed the home side’s best chance of the half before Milivojevic was handed his late chance to clinch the points. Email “De Bruyne stretchered off and Palace miss late penalty as Man City's winning run ends”. Feedback on “De Bruyne stretchered off and Palace miss late penalty as Man City's winning run ends”.